The University of Northern Iowa is a Core Institution of the Iowa Space Grant Consortium. ISGC supports NASA's mission by stimulating research, education, and outreach throughout Iowa. UNI students, faculty and staff - learn about ISGC funding opportunities. Register now for a UNI Smart Start Salary Negotiation Workshop. Sometimes it takes just one event to change the course of someone’s future. According to Lily Conrad, this was definitely the case when it came to her education. Lily, now a senior and an Environmental Science major, originally came to the University of Northern Iowa to study Exercise Science. A single trip to the NASA Space Exploration Educators Conference (SEEC) gave two UNI students an entirely new perspective on space education. This experience inspired them and a UNI professor to share the ideas and methods they learned with other pre-service teachers in the form of a workshop, which was covered in last week’s story and will be free to students. Dr. Ronald Rinehart, Tyler Brown (Physics Education), and Tori Wells (Elementary Education) will have a workshop on April 22nd at 3:30pm in Maucker Union's University Room for pre-service teachers who want to incorporate space exploration education into the classroom. The workshop is free to UNI students. 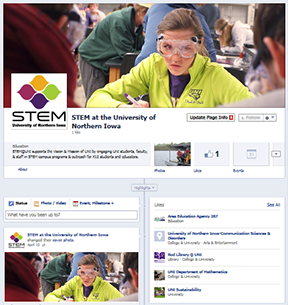 Welcome to the STEM at UNI website, portal to all things science, technology, engineering and mathematics related at the University of Nothern Iowa. Use the menu to the left to navigate. Many links will connect you to STEM content within other sections of the UNI website. Bookmark stemed.uni.edu. Please submit comments and suggestions through our contact page. Are you passionate about your STEM major or minor? Are you looking for volunteer experience or an opportunity to work with the community? Become a UNI STEM Ambassador. Learn more and apply. Faculty/Staff - recommend an ambassador here. Currently seeking STEM Ambassador Applications for SPRING 2019 now through January 25th. Applications recieved after January 25, 2019 will be considered for Fall 2019.